This message is more difficult to write than previous ones. My daughter from an earlier marriage, Lisa, would have been 46 next month. She contracted breast cancer 5 years ago but it seemed that it had been successfully treated. However, in July of last year it reoccurred in a very aggressive form. It metastasized throughout her body eventually reaching her brain. I visited her in Ohio in October when we were hopeful and again just a week before I left for Sri Lanka. During the last visit it was apparent that it would be terminal. I had hoped to visit her again in a few weeks when I return home. But this morning I received a message from her mother that she passed away yesterday. It happened very quickly at her mother’s home with her family and a hospice nurse in attendance. I would not normally burden others with this news but it is a necessary prologue to what I write next. I had come down to the computer lab at 5:30 in the morning to prepare the lessons for today when I opened her mother’s email. Shantha who was up doing his morning chores heard my anguish and came to see what was wrong. As he was so concerned, I tried to explain to him what had happened. I don’t think he understood very much of what I was saying. He only understood that I was grieving and he pulled up a chair and sat quietly by my side for over an hour and would not leave no matter how much I suggested he go on with his routine. 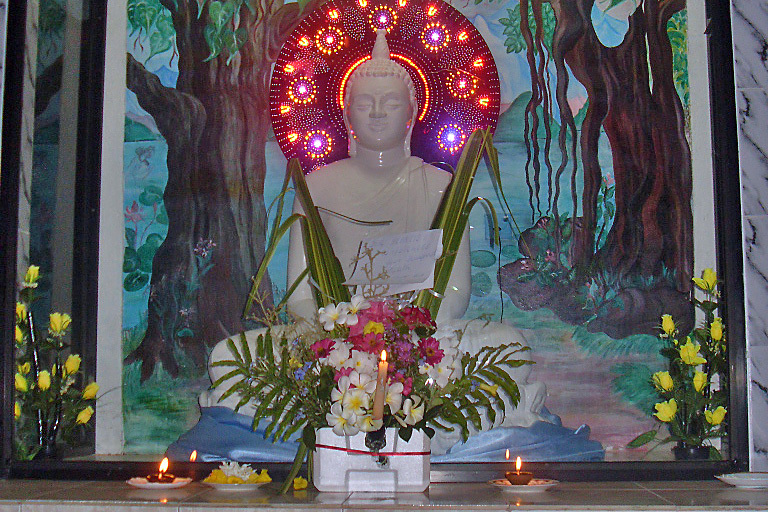 He only left after Bhante Piyananda awoke and came in to be with me. It was not until the teachers arrived at 9:00 that I could adequately explain what had occurred. I had decided to keep myself busy with the usual routine in an effort to maintain control of my emotions. Word apparently spread through the village because the residence and the entire compound were uncommonly quiet all day. In the afternoon Bhante Piyananda asked if it would be all right to hold a funeral puja this evening and I said, of course. At 6:30 my teachers dismissed the students an hour early and joined with the many other villagers who had come to join in the service. Madushi had organized a beautiful arrangement of frangipani and other flowers. 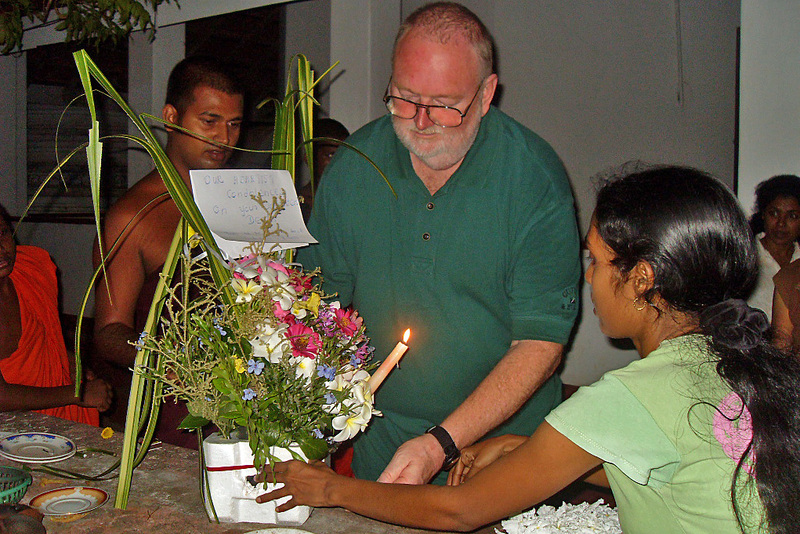 A message of condolence was hastily put together by Kokila and several of my English students from last year. 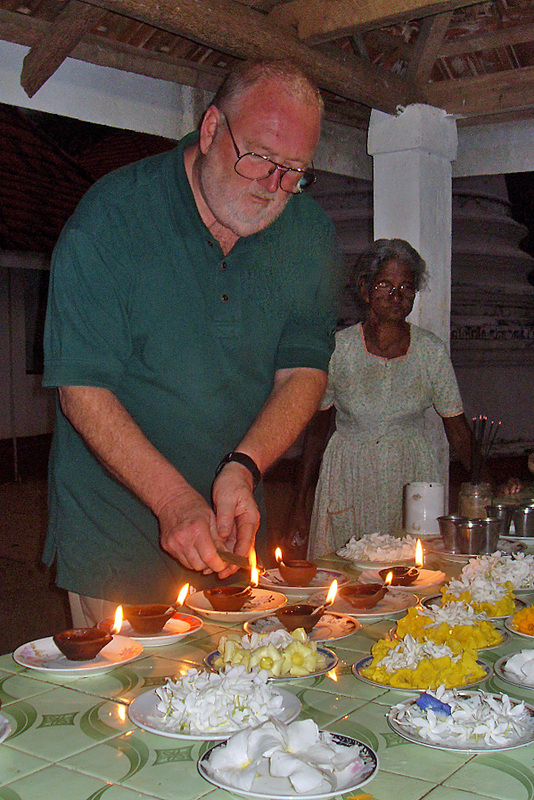 I was asked to light the oil lamps and incense and to place several flower offerings at the shrines. 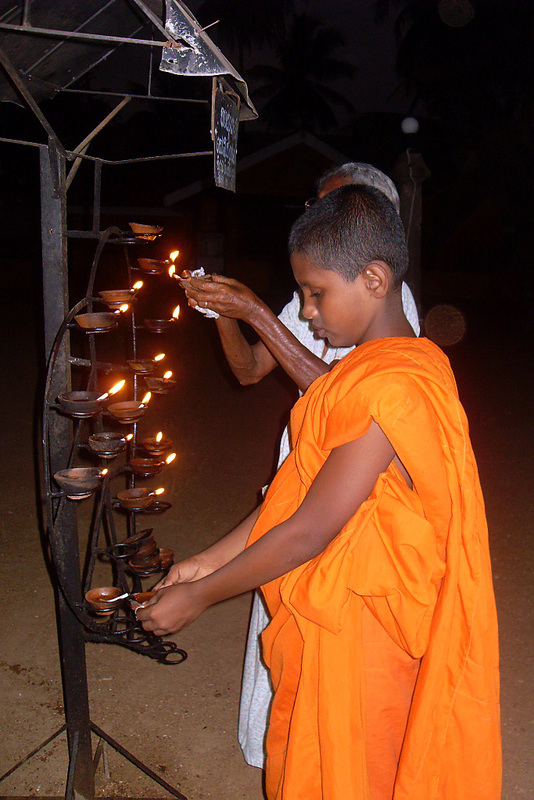 Nanda and all the others lit oil lamps and placed them in the holders outside the entrance. Then as many as possible, fit themselves into the small image house alongside me. Others overflowed into the darkness outside. 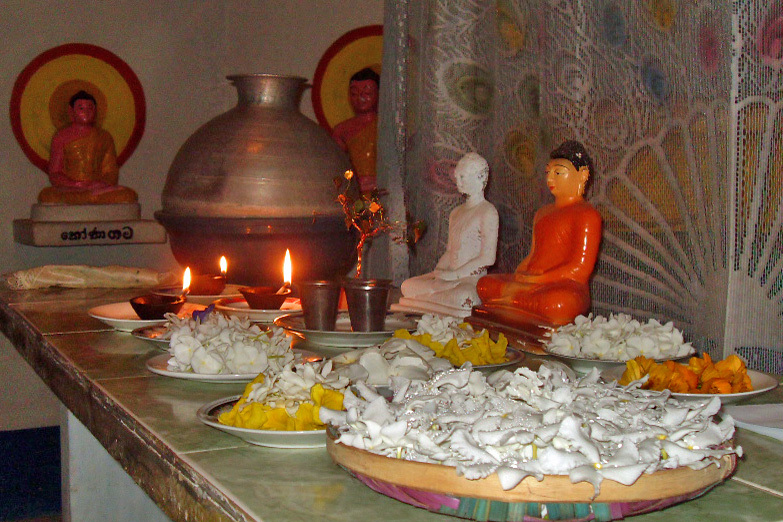 Bhante offered messages of condolence and on the cycle of birth and death translated into English by an elderly retired teacher who is a dear lady and constant friend during my visits here. Bhante and the other monks then chanted the traditional suttas meant for funeral services for about 45 minutes. 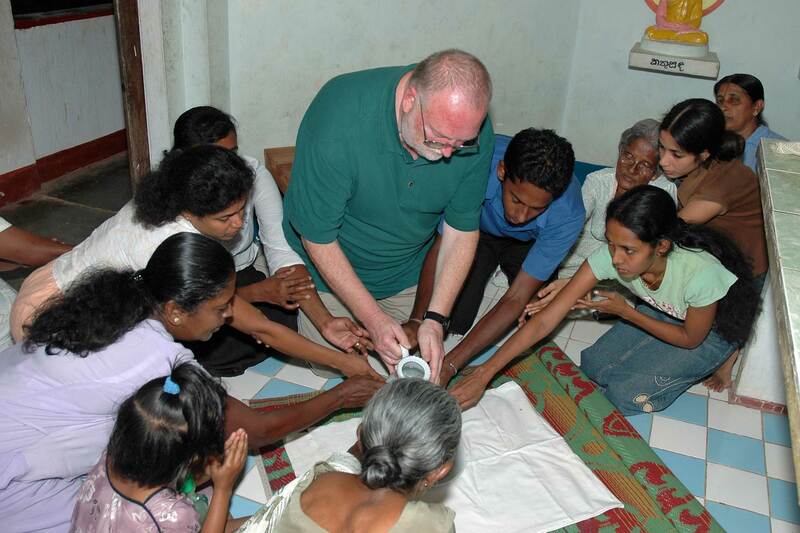 The final part of the service was for me to pour water from a pitcher into a cup overflowing it into a bowl while everyone who could reach, placed their hand on the pitcher. Those who could not placed their hands on the back of the person in front of them. This was to symbolize their willing transference of any merit (or grace) that they had accumulated to Lisa to help her pass quickly and safely on her journey. Today I have been deeply touched and honored by the outpouring of sympathy and concern shown to me by these lovely people. Most Asian cultures love to take photographs at any occasion including funerals. After dinner, some of the people brought me the digital pictures that they had taken of the service so that they could look at them on a PC. I have attached a few. I noted as I sat down to write this that almost 4 years ago to the day, I arrived in this village just 6 weeks after the Tsunami. Many of the villagers were still in grief over the loss of children, husbands, wives and parents to the flood that rampaged through the village. It would have been impossible for me not to share in their sorrow. Today they shared in mine. And so the cycle continues.